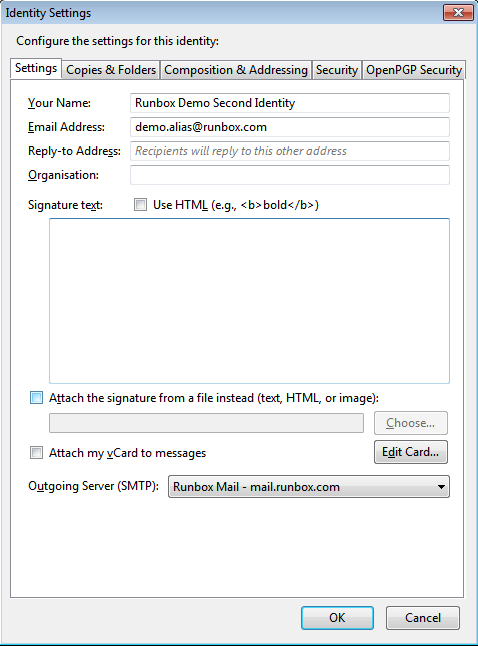 To set up Mozilla Thunderbird with Runbox, follow the step-by-step instructions below. 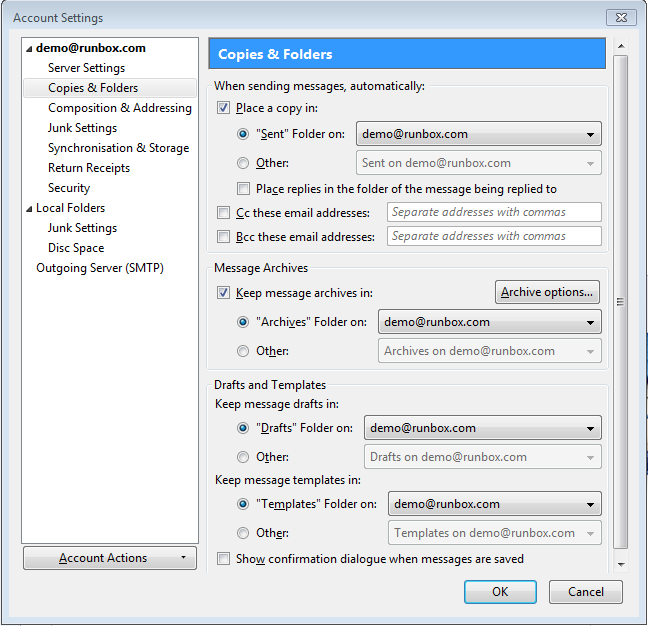 Please note that the setup process and dialog boxes on your computer may vary from what is shown here, depending on what version of Mozilla Thunderbird you are using. 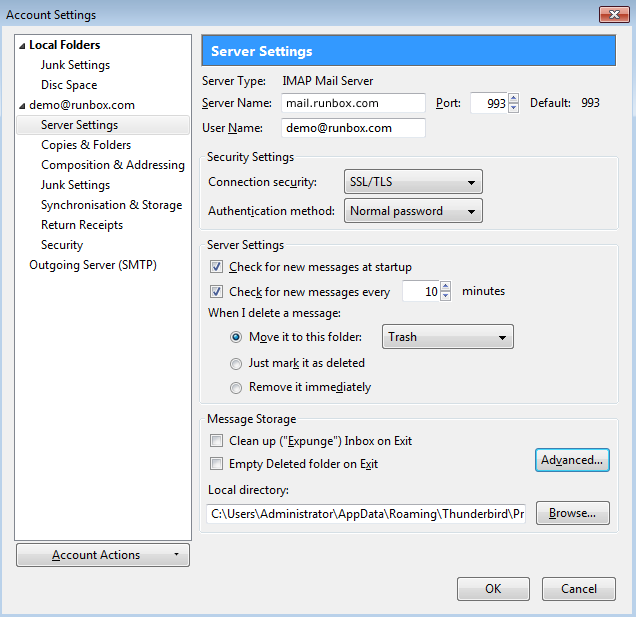 There are several ways in creating new accounts in Thunderbird. We will cover one of them here. 1. Start Thunderbird and from the menu bar choose File > New > Existing Mail Account you will then see a screen appear like the one below. Enter your name, email address and password in to the boxes shown and click Continue. 2. Thunderbird will try to automatically determine the settings for your account, but it is best to enter these manually yourself, so when the screen below appears please click on Manual config and continue to Step 3. 3. You will be presented with a screen that has more details, and you should enter the details as shown below (except using your own name, email address, username and password of course). When you have finished click the Done button and Thunderbird will verify your details with our servers. 4. You should then see a screen like the one below. If you do not see all of the folders in your account, we recommend restarting Thunderbird at this point and then continuing with the set-up instructions. 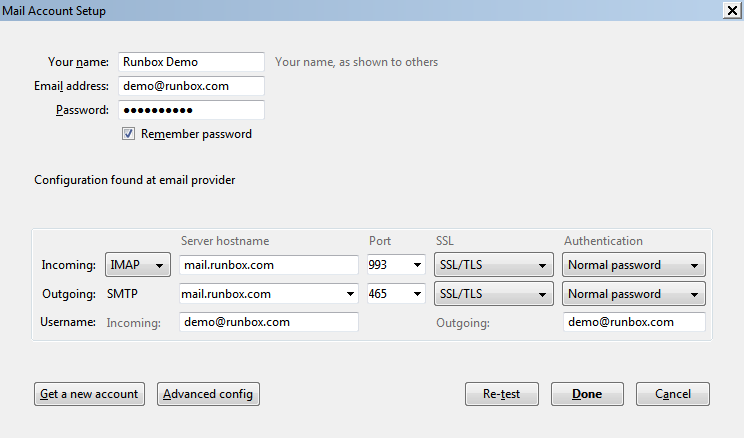 Right click on your account name, in the image below it is demo@runbox.com and click on Settings. 5. From the Account Settings window choose Server Settings. You should see your account details as you would expect them to be. Here you can change a number of settings including how often Thunderbird checks for new messages. 6. While you are on this screen, click Advanced. You will see the screen below. We recommend that you de-select the option to Show only subscribed folders as this can cause some folders to be hidden in Thunderbird. If you understand what this option is for and wish to use it then feel free to leave it selected. 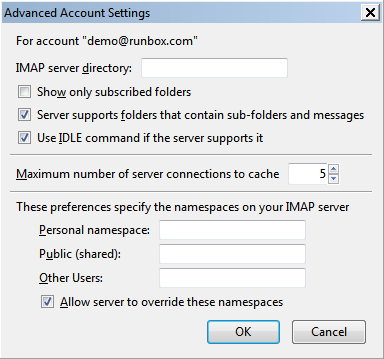 You can find out more about folder subscriptions by reading our guide to IMAP Folder Subscriptions. Once you are done, click OK on this screen and you will be returned to the previous screen. 7. From the Account Settings window choose Copies & Folders and makes sure that the settings are as below for your Sent, Archives, Drafts and Templates folders. 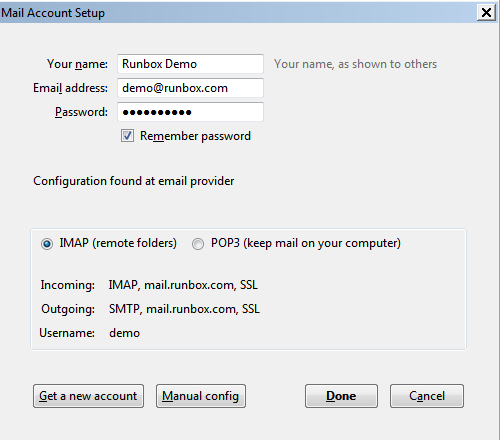 In each case choosing the corresponding same or similar named folder in your Runbox account. 8. Now choose the Junk Settings option and de-select Enable adaptive junk email controls for this account. The reason for this is that your Runbox account includes junk/spam protection, and ideally you should rely on those settings to filter spam to your spam folder. You can find out more about dealing with spam elsewhere on our help website. 9. 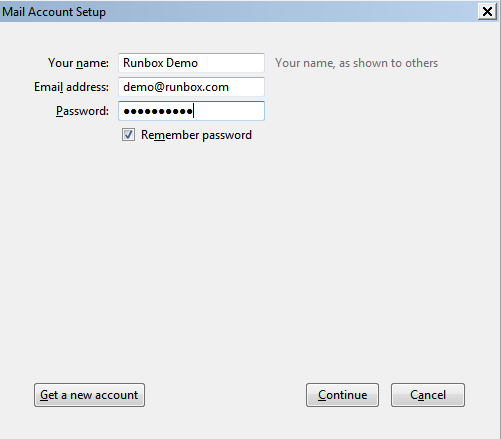 Finally, click OK and your Runbox account is set up. You might need to restart Thunderbird for all the changes to take place and for folders in your account to take effect. Thunderbird has the ability to let you set up different identities and aliases. An identity is a different outgoing name on an account that might also have other different features such as a different signature. An alias is an alternative email address that delivers to another main account address. You can use identities and aliases in any combination as shown in the examples below. You might use use Example 1 if more than one person shares the same email address, but you want outgoing email to show which person sent the message. Example 2 might be useful for things like online shopping where you want to show you real name but don’t want to use your main email address in case you start receiving marketing emails. Example 3 might be useful in a number of situations. If two people share an account but have individual email address, or if you also run an business and combine your personal and business email in the same account. Whatever you use identities and aliases for, Thunderbird can help. Follow the instructions below to see how to set up identities with aliases. 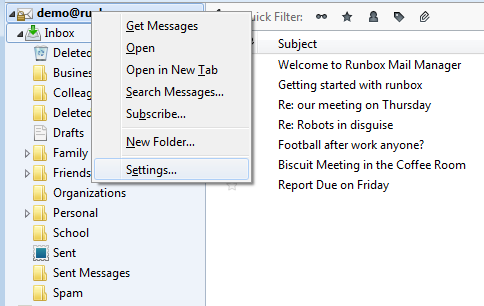 With Thunderbird open click Tools > Account Settings in the menu bar. When your account name is highlighted in the top left, you will see a Manage Identities button near the bottom right. Click on Manage Identities. You will see your default identity listed. Click Add. 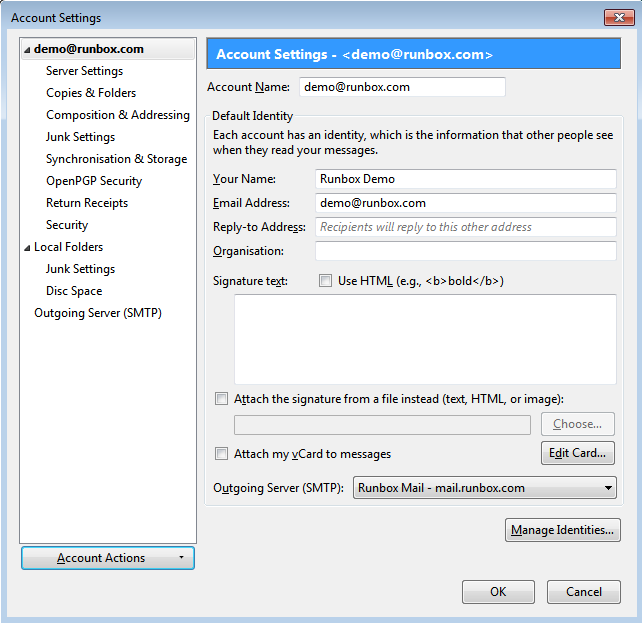 Enter the name you want to appear in your outgoing emails, in our example we have chose Runbox Demo Second Identity but obviously you will want something that is personal to your or your business. Enter the email address you want to have associated with this identity. This is the email people will see when they receive your emails and reply to. We have chosen demo.alias@runbox.com in our example. You will now see your default identity and new identity listed. The default one will be shown in bold. You can now click Close and exit from the account settings. Your new identity will be available to you in a drop down menu when you compose a new messages. If you need any further help in configuring Thunderbird, please contact Runbox Support.